She goes to the police but has to dodge Killian who is not Awake and not helpful. She does see Rumple but he’s decidedly unhelpful since he doesn’t like her much and pretty much thinks she has what’s coming to her. But he does have some advice on redemption which basically boils down to not forgetting who you are and what you were. Which is pretty much how Zelena has been talking about redemption: loving being Kelly who could forget her evil past (which isn’t redemption - it’s just self-serving salving of guilt. Ultimately she’s tried of atoning, not actually pushing to atone or redeem). He says you need to remember it, remember what you were so you don’t go back there. He does give her some jewellery, her nifty necklace, so she can continue to “fight against her past”. Ok but a shotgun would have been helpful. Or police protection. But she doesn’t kill him. She isn’t that person any more. 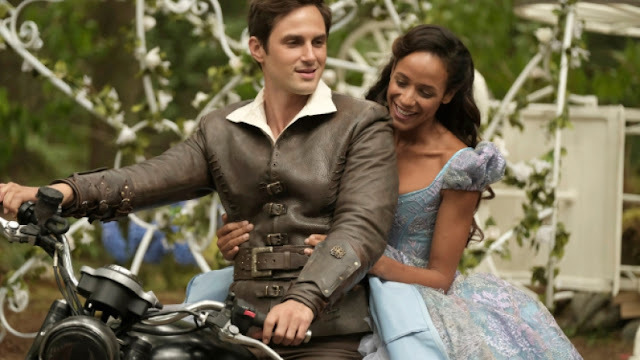 Instead she knocks him out and delivers him to Killian (who rescues Henry who goes to a reunion with Jacinda). Zelena then has an awkward conversation with Chad - telling him everything except the fairy tale stuff. Which is a pretty much a whole lot of everything. But he still loves her even the bits he knows nothing about and is determined to marry her. I’m sorry but WHAT? I want to sit down with Chad and ask who hurt him. “I love you even the bits I know nothing about” uh-huh, you have no idea what they were. What if she had 11 dead husbands with hefty life insurance Chad? What if she’s a secret cannibal? What if she voted for Trump? This, this is such a wonderful speech and a wonderful scene. How many villains, how many redemption arcs rely on letting one go. That one spared life. That one brief act of whimsical kindness to balance a pile of bodies. That one brief instance of not killing someone is somehow proof of being good. But just like Negan on The Walking Dead claiming to be a “Saviour” because he only kills some people, it rings hollow and the piling victims speak loudly as to the value of Letting One Go.